For the town of Cuba in New York State, USA, see Cuba (town), New York. 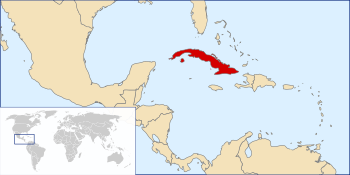 Cuba is an island country in the Caribbean Sea. The country is made up of the big island of Cuba, the Isla de la Juventud island (Isle of Youth), and many smaller islands. Havana is the capital of Cuba. It is the largest city. The second largest city is Santiago de Cuba. In Spanish, the capital is called "La Habana". Cuba is near the United States, Mexico, Haiti, Jamaica and the Bahamas. People from Cuba are called Cubans. The official language is Spanish. Cuba has a warmvery year. In the 2000s, tourism to Cuba began to make money for the island again. Though Fidel Castro had remained in power, he had passed all duties to his brother Raul after an illness. Fidel Castro was one of the longest-serving heads of state. In 2008, Raúl Castro became the official president of Cuba. For military service, men from the age of 17 to 28 years old must go into the army for two years. Cuba Facts for Kids. Kiddle Encyclopedia.